Boats carrying nearly 600 Bangladeshis and long-persecuted Rohingya Muslims from Myanmar washed to shore in western Indonesia, some after captains and smugglers abandoned the ships, leaving passengers to fend for themselves, survivors and migrant experts said. Thousands more are believed to be stranded at sea. When the four ships neared shore early Sunday, some passengers jumped into the water and swam, said Steve Hamilton, of the International Organization for Migration in Jakarta, Indonesia's capital. They have been taken to a sports stadium in Lhoksukon, the capital of North Aceh District to be cared for and questioned, said Lt. Col. Achmadi, chief of police in the area, who uses only one name. Sick and weak after more than two months at sea, some were getting medical attention. 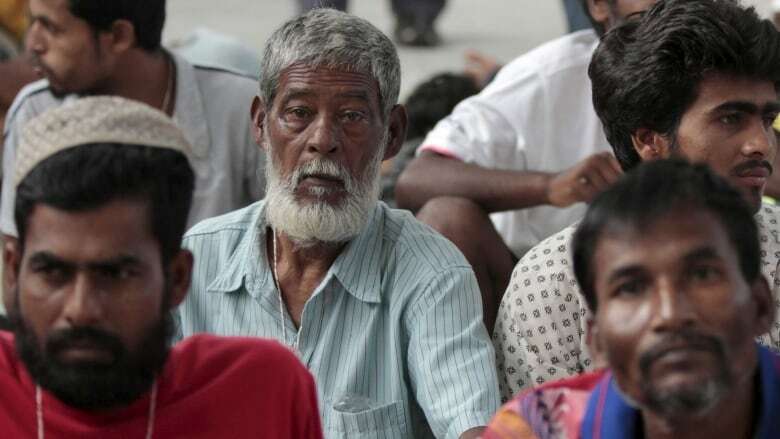 "We had nothing to eat," said Rashid Ahmed, a 43-year-old Rohingya man who was on one of the boats. He said he left Myanmar's troubled state of Rakhine with his eldest son three months ago. "All we could do was pray," he said, crying as he spoke to The Associated Press by phone. The Rohingya have for decades suffered from state-sanctioned discrimination in Myanmar and are denied citizenship. An estimated 7,000 to 8,000 people are now being held in large and small ships in the Malacca Strait and nearby international waters, she said, adding that crackdowns on trafficking syndicates in Thailand and Malaysia have prevented brokers from bringing them to shore. Some are held even after family members pay for them to be released from the boats. "I am very concerned about smugglers abandoning boatloads at sea," Lewa said, noting that some people have been stranded for more than two months. Tightly confined, and with limited access to food and clean water, their health is deteriorating, Lewa said, adding that dozens of deaths have been reported. The tactics of brokers and agents started changing in November as authorities began to tighten security on land — a move apparently aimed at appeasing the U.S. government as it prepares to release its annual Trafficking in Persons report next month. Last year, Thailand was downgraded to the lowest level, putting it on par with North Korea and Syria. Up until recently, their first stop was Thailand, where they were held in open pens in jungle camps as brokers collected "ransoms" of $2,000 or more from family and friends. Those who could pay continued onward, usually to Malaysia or other countries. Those who couldn't were sometimes beaten, killed or left to die. Thai authorities have since arrested dozens of people, including a powerful mayor and a man named, Soe Naing, otherwise known as Anwar, who was accused of being one of the trafficking kingpins in southern Thailand. More than 50 police officers are also under investigation. Similar crackdowns have occurred in Malaysia and Bangladesh, where raids left at least one top smuggler dead. That has sent brokers and agents into hiding and may also explain why some captains and smugglers were abandoning ships, leaving their "passengers" to fend for themselves, in some cases with little or no food or water. Officials are bracing for the possibility that more boats will land in Indonesia in the coming days and weeks. Hamilton, of the International Organization for Migration, said three of the wooden boats that arrived in Aceh on Sunday had been abandoned by the smugglers and the fourth ran out of fuel. They had apparently been travelling together from Rakhine State. Achmadi, the local police chief, said that so far 573 Rohingya and Bangladeshis have been registered, including 98 women and 51 children. He said the number would likely climb because passengers were scattered along the coast after reaching shore, seeking refuge with residents or at mosques.